Even the cleaner product lines, like Seventh Generation and Ecover, don't provide full disclosure. Then Green Shield Organics waltzed into my life. 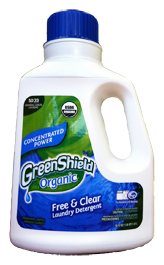 This company was founded on the principle of creating green cleaning products with complete ingredient listings. When their laundry detergent arrived on my doorstep I was so excited I could not wait to do a big heaping pile of laundry. Yes, seriously. Water, Cocos Nucifera (Saponified Organic Coconut Oil), Sapindus Mukorossi (Organic Soap Nuts), Aloe Barbadensis Leaf Juice Powder (Organic Aloe Vera), Glycerin (Organic), Sea Salt, Sodium Carbonate, Sodium Bicarbonate, Cyamopsis Tetragonoloba Gum (Organic Guar Gum), Acacia Senegal Gum (Organic Acacia Gum), Xanthan Gum, Quillaja Saponaria (Organic Soap Bark). It's nearly too good to be true. And I'm happy to report, after my behemoth pile of laundry, I know it works. To top it all off, they sell fantastic bathroom, kitchen and all purpose cleaners as well. Love that you posted on laundry detergent. That's something I didn't initially think about when I went natural. I use the Dr. Bronners Sal Suds and sometimes add some tea tree oil to keep things fresh. I love Dr. Bronners. They are one of the cleanest and most ethical companies around. However, their Sal Suds contains a sulfate, which I try to stay away from. They say that they formulate their sulfate differently, so that it isn't a skin irritant. However, I prefer to stick to the gentlest cleansers, such as the saponified oils in Green Shield Organic's line. How "heavy-duty" is this detergent? I've looked into it, but I've been hesitant since the surfactant is from soap nuts.... which I haven't had success with for cloth diapers :( Maybe the washing soda in the formulation makes this work better than straight soap nuts though. To be honest, my laundry isn't quite "heavy duty," (no grass stains/diapers) so I haven't tested its limits. Does anyone else have any experience with this? Environmental Working Group lists Acacia Senegal Gum as being moderate concern for skin allergy/irritation and as respiratory irritant. Grade is D+. Since this laundry detergent is in liquid form, inhallation shouldn't be a concern.